Adaminaby: Why Live in Adaminaby? Adaminaby Real Estate is located on big blocks with some on acreage. The town is a picturesque, mountain village with a majority of the homes being a short walk from the town centre. 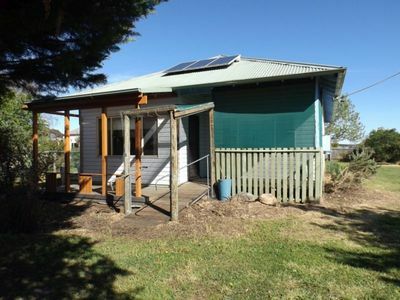 Situated close to the snow fields and Lake Eucumbene, it is a perfect year round location. The homes are Australian homestead style, with weatherboard, brick or timber construction. The older homes have polished wooden floors and big open fireplaces, to ensure they convey their historical and natural charm. The bushland setting is pristine, and the timber cottages that are scattered throughout the area complement the surroundings. The town has all the essential services, including a supermarket, grocery and hardware shop, a post office and service stations. Other shops in the area include an op shop, bait and tackle shops, a real estate and ski, snowboard and clothing hire and sales. The town has a Public School, for primary aged children. The closest high schools are in Cooma. Monaro High School is Cooma’s only public high school, it serves the town and seven of the neighbouring rural towns and villages such as Berridale, Jindabyne, Nimmitabel, Bredbo and Dalgety. There are also two public primary schools including Cooma Public School and Cooma North Public School, both providing education for students in kindergarten to year 6. There is a Roman Catholic school called St Patrick’s Parish School providing education from kindergarten to year 10. Cooma also has a private Christian school known as Snowy Mountains Christian School. TAFE NSW Illawarra Institute Cooma Campus provides further education. Adaminaby is approximately 30 minutes from Cooma, 2 hours from Canberra, 5 hours from Sydney and 7.5 hours from Melbourne. The town has a bus service but has limited public transport otherwise. The area is a freshwater Fisherman’s Paradise. The area offers a choice of lake and river – with fly, lure, trolling and bait fishing. The Snowy Mountains offers unique horse, motor and mountain bike experiences. It is where the real ‘Man from Snowy River’ came from and there are horse trekking specialists who will expertly guide you through untouched bushland. The Snowy Mountains Highway offers motorbike enthusiasts one of the great Australian riding experiences and the locals will welcome you too. And if you are after a unique mountain biking experience, there are plenty of options as well. There are many walks in Northern Kosciuszko National Park, through sub alpine snow gums, open treeless valleys and forested country. In Spring and early Summer you can see rare and spectacular alpine wildflowers. Snow sports at the family orientated Selwyn Snowfields include alpine, snowboarding and cross country skiing, as well as snow tubing, tobogganing and snowplay. Selwyn Snowfields is the ideal place for the learner and for family groups who are looking for a fun day on the slopes. The Adaminaby area is also the accommodation and service base for Selwyn Snowfields, which is just over half an hour’s drive from town. At the Adaminaby (Kennedy) Airfield where the Snowy River Aviators and the Ultralight Flying Obsession are located, you can arrange a flight to see this amazing landscape from the air. The Snowy Mountains Hotel cooks home style meals in Winter, the Bowling club offers club style meals and the Snow Goose Hotel has pub style meals available. The bakery has a range of baked goods, sweets and coffee and the Snowy cafe sells coffee and snacks, eat in or take-away. Kiandra was the scene of intense gold fever from 1859 to 1861 – it has been claimed that in 1860 up to 10,000 people were on the diggings living under canvas. There is a self-guided walk offering interpretative signs along the way, providing information about many of the major buildings, life and folklore of historic Kiandra. The town is a popular base from which to fish on Lake Eucumbene and surrounding rivers and the town centre features a large sculpture of a trout, standing 10 metres (33 ft) high. Commonly known as the Big Trout, it was one of the earliest of Australia’s Big Things and in May 2006, the lake Eucumbene Chamber of Commerce adopted the tourist attraction as a marketing and promotional ‘brand’. The Big Trout was built by Andy Lomnici and was restored and repainted by Skins Alive in January 2007, with funding from the Snowy River Shire Council. Adaminaby and its smaller ‘sister’ townships of Old Adaminaby and Anglers Reach are set among the rolling high plains in the New South Wales Snowy Mountains, with Kosciuszko National Park at their doorstep. At an elevation of over 1000 metres. The Snowy Mountains region was an important gathering point for the Aborigines of the Adaminaby and surrounding districts for many thousands of years, with inter-tribal summer meetings being held in the High Country involving up to a thousand people for feasting on the Bogong Moth. This practice continued until around 1865. Europeans penetrated the district from the late 1820s and Adaminaby first began to develop as an agricultural centre from the 1830s, with sheep and cattle becoming an economic mainstay. In addition to agriculture, the fortunes of the town were affected by the discovery of gold at nearby Kiandra in 1859 and subsequent introduction of recreational skiing to the district around 1861. Kiandra\’s ski facilities were permanently shifted “up the hill” to Selwyn Snowfields in 1978 and Adaminaby remains the main service centre for the Northern skifields, one of the oldest areas for recreational skiing in the world. The most momentous episode in the town’s history, came with the construction of the vast network of tunnels and dams of the Snowy Mountains Hydro-Electric Scheme, which began at Adaminaby in 1949. A lake nine times the volume of Sydney Harbour eventually flooded the valley in which the original townsite lay. A prolonged drought saw the ruins of the old township begin to resurface in April 2007, attracting the attention of global media. Today a tourist village has been built around the handful of buildings which were not relocated from the newly created lakeshore at Old Adaminaby. So if you are looking for Adaminaby Real Estate, why not talk to one of our sales team at Fisk and Nagle.